The International Socialist Organization has had a presence at Columbia University since the early 1990s. In 1992, the Barnard/Columbia ISO was involved in a successful fight to preserve need-blind admissions. Hundreds of students occupied Low Library, but faced no punishment. Later that year, students occupied Hamilton Hall in protest of Columbia's plan to demolish the Audubon Ballroom, the site of Malcolm X's assassination – a plan which was carried out nevertheless in 1994. Members of the Black Students' Organization and the ISO were identified by the Columbia administration as ringleaders. 4 students, including a member of the ISO as well as three members of the BSO, were suspended, and 45 others were given less serious punishments. A fifth student, another member of the ISO, was found innocent of charges which would have led to her suspension because the judge believed that she was too small and female to have blocked a door. In 1996, students won the creation of the Center for the Study of Ethnicity and Race after months of struggle, in which the Barnard/Columbia ISO was involved. The Center remains underfunded and without the ability to hire or tenure faculty, but students can major in Ethnic Studies. 3 students launched a 15-day hunger strike, 23 students were arrested for occupying an office in Low Library, and hundreds of students took over Hamilton Hall overnight. In 1998, when affirmative action foes Ward Connerly and Dinesh D'Souza came to speak at a conference at Columbia, protesting students, including members of the Barnard/Columbia ISO, rushed the building where they were scheduled to speak, and ate the food at a banquet table that had been laid out for the invited guests. D'Souza's speech was moved off campus, and held instead on the sidewalk of Morningside Avenue. The Barnard/Columbia ISO was involved in the movement against police brutality in 1999 after Amadou Diallo's murder, and again in 2006 after Sean Bell's murder. From the late 1990s through 2005, members of the ISO were active in the Campaign to End the Death Penalty on campus. New York's highest court found the state's death penalty statute unconstitutional in 2004, and after hearings in 2005, the State Assembly voted against reinstating it. In both 2000 and 2004, the ISO helped build Ralph Nader's campaign on campus, as an alternative to the two corporate parties. When the Supreme Court appointed Bush in 2000, Barnard/Columbia ISO members joined scores of others in the Columbia Student Solidarity Network in traveling to DC to protest his inauguration. ISO members also joined in the massive protests against the 2004 Republican convention in New York City. In 2002, ISO members were involved in an unsuccessful effort to force Columbia to divest from companies which support Israel's occupation of Palestine. A petition received more than 500 signatures, and a pro-Palestine rally drew over 400 people. However, President Bollinger condemned the effort, and the University took no action. In 2004 and 2005, the Barnard/Columbia ISO defended professors who came under attack for criticism of Israel. After an outside Israel advocacy group, the David Project, produced a video, 'Columbia Unbecoming', attacking several professors, particularly Joseph Massad and other members of the MEALAC department, ISO members joined with other students to create a coalition to Stop McCarthyism at Columbia. A university investigation cleared Massad of all charges but one – an alleged incident which 20 of Massad's former students then signed a letter denying had occurred. Massad was not officially sanctioned, but the MEALAC department was placed in receivership. 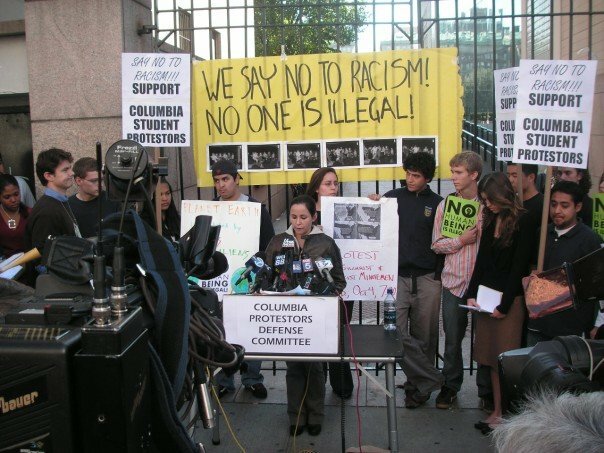 In 2004, members of the Barnard/Columbia ISO joined rallies of hundreds of students organized by the ad hoc Concerned Students of Color coalition in protest of a racist climate on Columbia's campus, after an anti-affirmative action bake sale and a racist cartoon in campus humor paper, the Fed. In 2006, ISO members joined the group Stop Hate on Columbia's Campus in renewed protest after a series of racist and homophobic hate crimes. After each set of anti-racist protests, students won a limited subset of their demands from the University: a Vice Provost for Multicultural Affairs, new special interest housing, and some anti-oppression training – but no changes in the curriculum, in the admissions and faculty hiring processes, or in the resources allocated to academic departments that address ethnicity, gender, race, power and privilege. In 2001, when the Bush administration launched a war on Afghanistan as a response to the attacks of September 11, the Barnard/Columbia ISO was part of the opposition. Members helped organize a peace vigil in the days after the attacks, and then helped found a new campus antiwar organization, People for Peace. This group unfortunately split after organizing several successful speak-outs and teach-ins, but the movement was revived on a much larger scale in 2003 by the planned invasion of Iraq. Almost a thousand people rallied on the quad in an attempt to stop the war before it started; ISO members helped organize the demonstration and spoke at it. The movement on campus again faced trouble, when the worldwide protests failed to stop the war, demoralizing many. Nevertheless, in 2004 and 2005, a coalition of antiwar and LGBTQ rights activists, including the ISO, successfully fought off an attempt to return ROTC to campus – leading one embittered ROTC advocate to falsely charge members of the ISO with 'verbally attacking' him. As the death toll from the war in Iraq grew to ever more massive proportions, the number of students ready to take action to call for immediate U.S. withdrawal continued to increase. More than a hundred students took buses to each of the national antiwar demonstrations in Washington DC on September 24, 2005 and January 27, 2007. 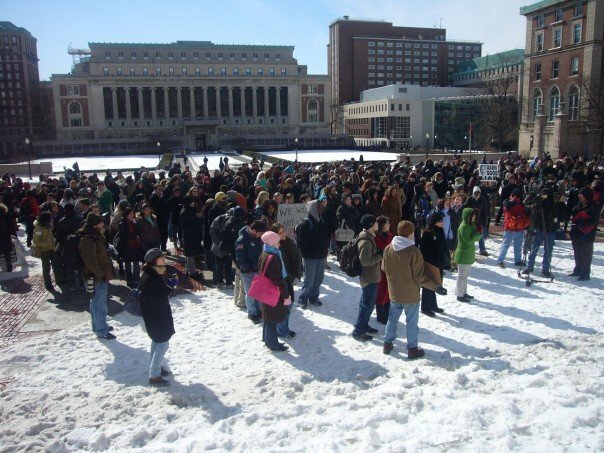 The Columbia Coalition Against the War, of which the ISO is a member group, organized a 300-plus person strike and rally, the largest at Columbia in four years, on February 15, 2007. 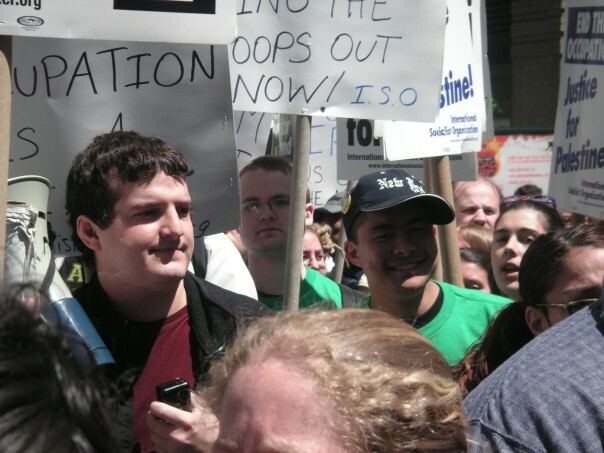 In the spring of 2006, the Barnard/Columbia ISO helped bring students to immigrant rights demonstrations, both the protests of thousands in April and the march of hundreds of thousands on May Day. In the fall, when the founder of the racist vigilante group the Minuteman Project, Jim Gilchrist, came to Columbia to speak, ISO members took the stage and unfurled a banner reading “No Human Being Is Illegal” in three languages in protest. Many audience members joined in the demonstration, and the Minutemen responded with violence, leading to the premature end of the event. 3 ISO members were among those charged with violations of the University rules in the aftermath, and were given 'disciplinary warnings', the lightest possible punishment.